rcus Odyssey is an action RPG video game developed by Wolf Team. The game was released in 1991 for the Sega Mega Drive/Genesis, Sharp X68000 and Super Famicom. The game is a cross between fantasy and science-fiction themes reminiscent of the Gauntlet series. The music for the game was composed by Motoi Sakuraba, who also did the music for the Star Ocean series. An American version for the Super NES was planned, but it was cancelled following Sega's acquisition of Renovation Products (American publisher for Wolf Team and Telenet games). 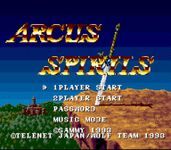 The Super NES version was, however, released in Japan, with the title Arcus Spirits.